Sears Holdings (SHLD), the operator of Sears and Kmart stores, Thursday reported a wider third-quarter loss as sales fell 5%, especially in its namesake stores. "While Kmart improved profitability, our third-quarter results were disappointing, in large part due to lower sales of apparel and appliances at Sears," said interim President and CEO Bruce Johnson. "Our seasonal apparel sales were down, with the unusually warm weather being a contributing factor. Additionally, during the quarter we reduced our usage of short-term borrowings." 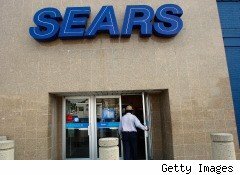 Sears said it lost $218 million, or $1.98 per share, nearly double last year's loss of $127 million, or $1.09 per share. Analysts had expected a loss of $1.08 per share. Sears operating loss for the quarter nearly tripled to $292 million from $106 million in 2009, and was primarily the result of a decline in sales, coupled with a margin rate reduction. Total revenues decreased 5% to $9.68 billion for the quarter from $10.19 billion last year. Revenue also missed analysts' expectations of $9.89 billion. The decline, the company explains, was primarily a result of a 4.8% decrease in domestic comparable-store sales (sales at stores open at least a year) and the effect of having fewer Kmart and Sears stores, though this was partially offset by the Canadian foreign exchange rate. Domestic comparable-store sales decreased 0.7% at Kmart, primarily driven by the food and consumables and pharmacy categories, partially offset by increases in the apparel, toys, consumer electronics and sporting goods categories. However, the retailer improved profitability and margins. Comp sales dropped a whopping 8.2% at Sears Domestic, largely driven by declines in the home appliances, apparel, and consumer electronics categories. Sears, which had been making some progress with cost-cutting measures and improved comp sales at Kmart until earlier this year, seems to have lost some momentum -- small as it was. With shoppers still strapped for cash, the holiday season will be crucial for the company. Sears shares slid over 2% in premarket trading.